Pause then enter beneath turf canopy, emerge and encounter a panorama at the top of the hill. Turn back on yourself and take shelter for a moment on a bench held by the land and roofed by its fauna. 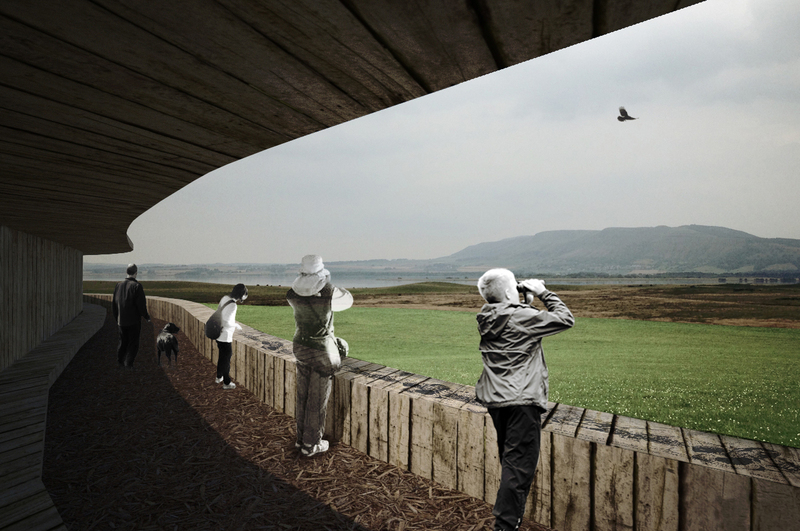 A contemporary cave, it's mouth framing the view of Loch Leven and the landscape surrounding. A woven hollow on the hill's prow providing time to pause think and observe; still, windless shelter. The calm eye of refuge and outlook in an otherwise exposed landscape. 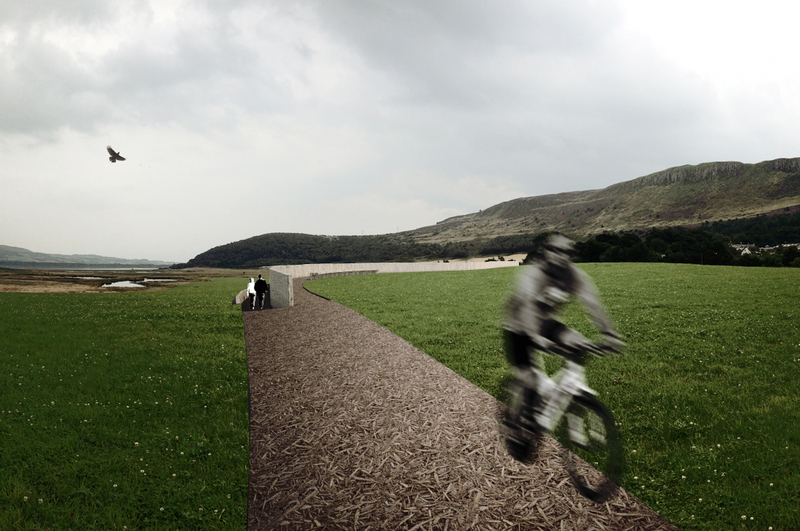 GRAS were selected to submit proposals for a new lookout and rest stop on the Loch Leven Heritage Trail in Fife. 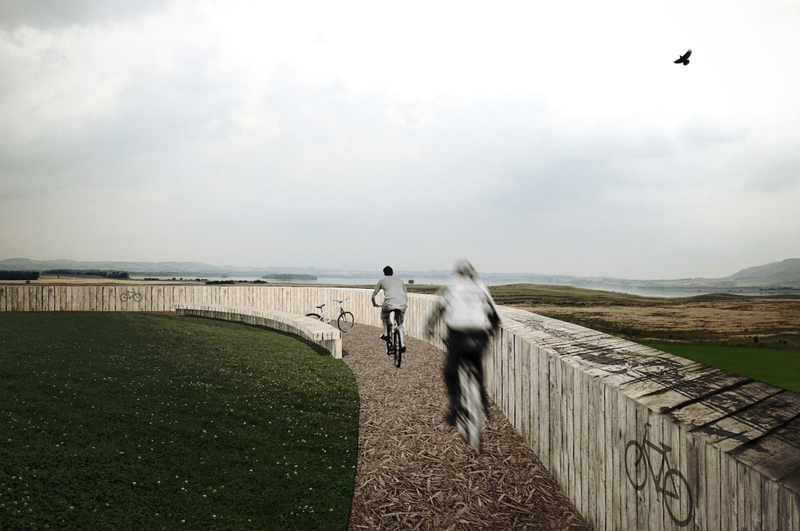 The viewpoint is designed to encourage visitors travelling in either direction to pause to rest, appreciate their surroundings and contemplate their journey. When approached from either direction, it first becomes visible as a dry stone wall edge to the path. As the banks either side of the path rise up, the ground gently falls leading the visitor down into a broch like entrance wide enough for cyclists and pedestrians to pass. Timbers laid across the path heighten the senses and advise cyclists to slow or dismount on approach. 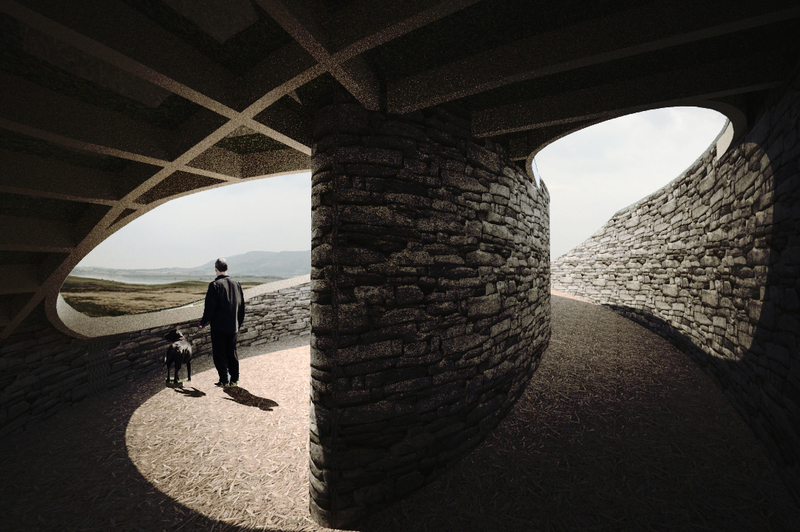 As the path decends into an enclosed passage, the distant view is obscured and the eye is drawn to the textures of the stone walls and wall-growing fauna either side and the timber framed earth roof overhead. A 180 degree turn in the passage brings the visitor to a cavernous, sheltered space with a large single aperture cut from the undulating roof to frame the distant view with a ribbon of timber. 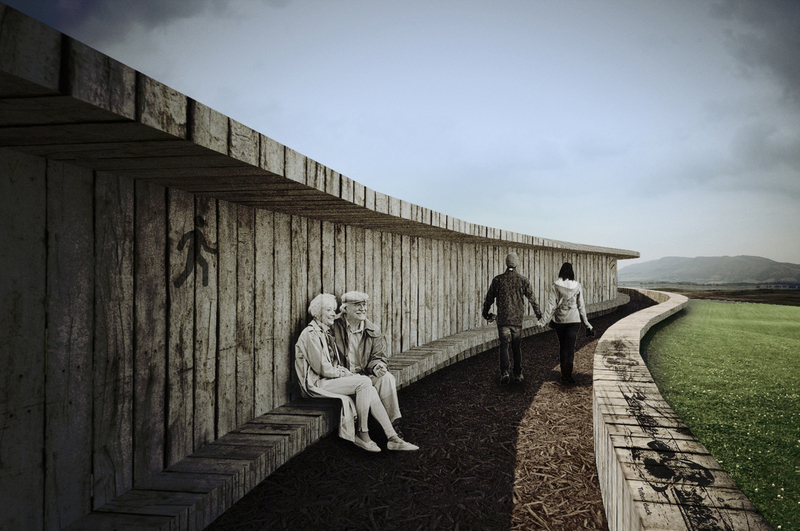 Here visitors can sit on a long bench beneath a cantilevered roof and admire the panoramic view or interpret their surroundings with the pictograms and text etched into the timber ribbon running the full perimeter of the aperture. The space is large enough to hold a small group but small enough to feel intimate with one or two people. The nature of the two paths meeting in a sheltered space encourages visitors to engage with one another. 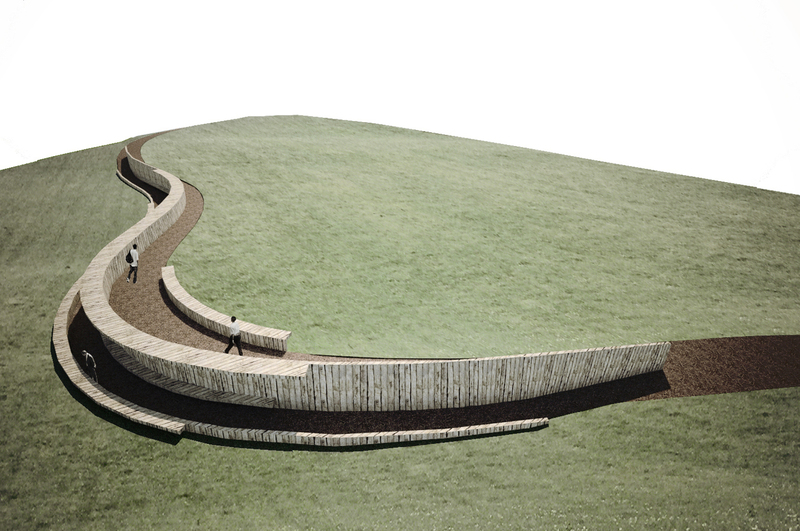 The viewpoint is located on a natural slope, which is dug away to form the enclosing space. Drystone retaining walls form the vertical edges while a timber frame supports the wild, grassy landscape which runs over the top of the enclosure. On one side the ground plane rises to form a covered space while on the other side it drops, to reveal the view and bring the small scale flora and fauna to a height where they can be easily viewed alongside the accompanying interpretative information. The form is principally derived by the fold in the path and the natural fall in the landscape, but is inspired by ancient Scottish forms of construction such as Holms and Brochs and later blackhouses and crofts. Its organic, sinuous form references natural forms of construction such as cocoons and the weaver birds nest to create an organic enclosure, appropriate for peaceful contemplation. GRAS is part of Groves-Raines Architects Ltd.